Abortion is illegal in Argentina aside from under exceptional circumstances, like when a woman has been raped or her life is in danger. Even then it can be difficult to find a doctor willing to carry out the procedure. But immense public pressure has forced the centre-right government to table the issue—previously considered off limits—for discussion in 2018. 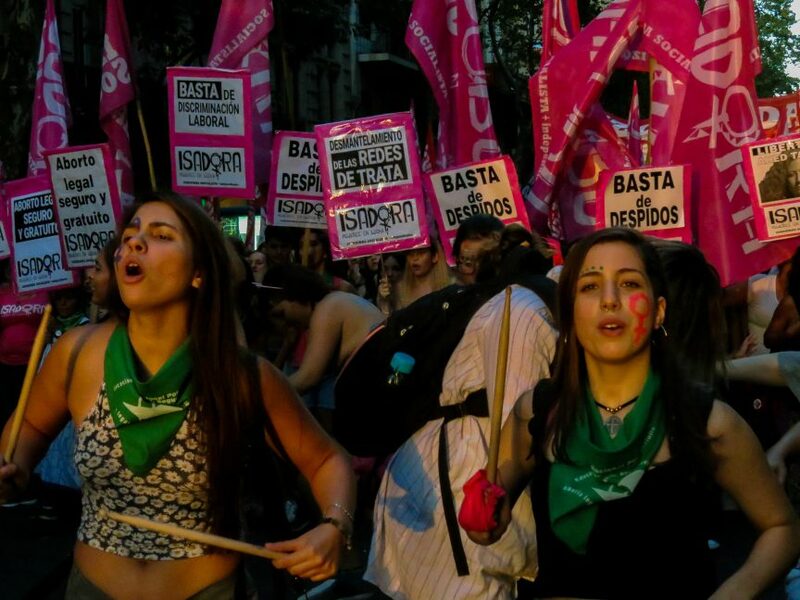 Green, the colour of the country’s pro abortion campaign, dominated this year’s Women’s Day march, where Argentina’s feminists turned out in force to demand their right to choose. A bill currently passing through congress would allow terminations in the first 14 weeks of pregnancy. But while this appears to be a step forward, six similar legislative proposals have so far been rejected in the campaign’s 13 years of existence. 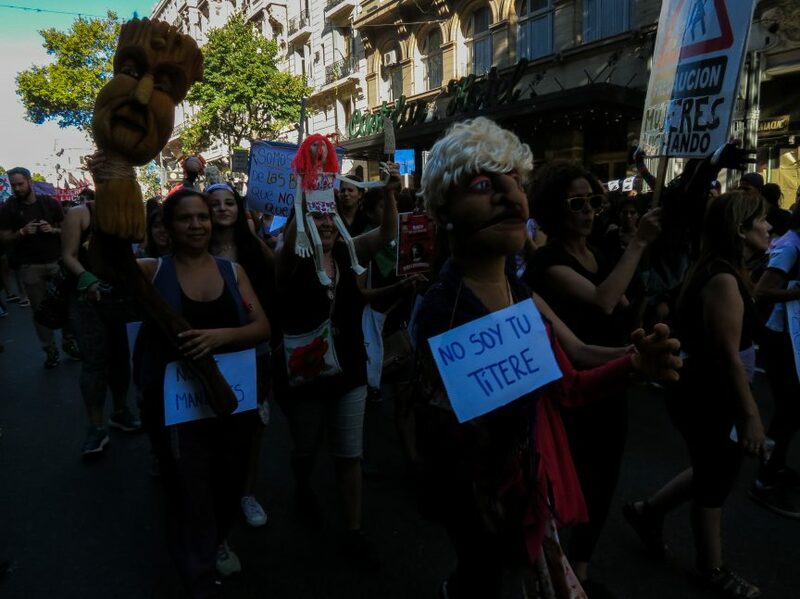 In a country that remains staunchly conservative, Argentina’s feminist movement see it as up to them to push the legalisation through. The current right-wing president Mauricio Macri, himself an abortion opponent, allowed the proposal to be considered by congress. A peculiar presidential vetoing power was invoked by his predecessor, centre-left Cristina Kirchner, to impede a parliamentary vote on abortion. Now, as a member of Argentina’s senate, Kirchner could again block access to free, safe and legal abortion—or she could hold the key. The criminalisation of abortions, punishable by up to four years in prison, made headlines in 2016 with the case of ‘Belén’, a woman from the rural province of Tucumán. In 2014, Belén, whose real name and identity is secret, went to a public hospital with abdominal pains. She was diagnosed with a spontaneous abortion and medicated. While she was asleep, doctors found a foetus in one of the hospital toilets. She woke up surrounded by police, who arrested her. She was accused and convicted of aggravated homicide, spending 29 months in prison as a result. Her initial public defenders failed to demand a DNA-test of the foetus, something her pro-bono feminist lawyers did when she appealed in 2016. The foetus was not hers and in mid-2017, Belén was acquitted in a landmark ruling. Belén told Novara Media the case was used to scare women away from having abortions. “I think my case was intended to spread fear”, she said, “to tell you that if you have an abortion you will go to prison, like me”. 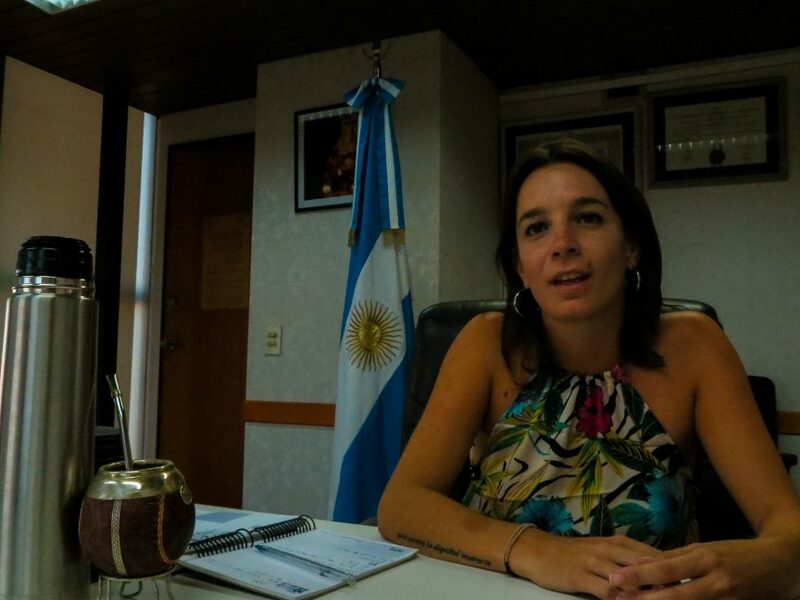 39-year old teacher Celeste MacDougall has accompanied the movement for nine years as an activist and fought hard for Belén’s release. A straight-talking, seasoned organiser of the yearly women’s march, she refused to speculate on the future. “The women’s movement considers this to be the moment to legalise abortion. We’re on alert and more mobilised than ever” said MacDougall. “We don’t trust anything but our own mobilising strength. We forced the government to listen to us and will continue fighting until the rights of women are guaranteed”. Chants against the Catholic church and promises of continued civil disobedience were commonplace at the predominantly young and female protest, which was the biggest yet. 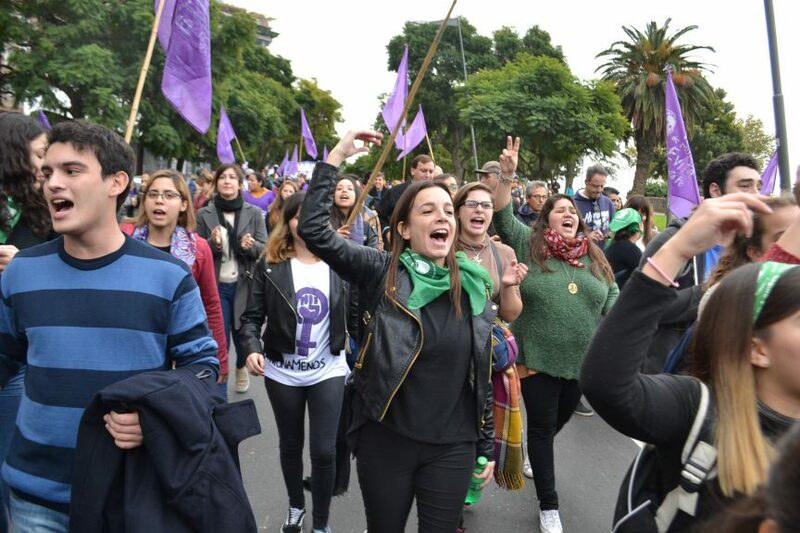 The size of the march was in no small part due to the substantial adhesion of trade-unions, which have strong ties to Ni Una Menos, the network whose fight against femicides in June 2015 broadened and boosted the country’ feminist movement. Deadly violence against women claimed 304 lives in 2017, said Raquel Vivanco, a spokesperson for Mumalá, the Ni Una Menos femicide observatory. “That’s one every 29 hours”, Vivanco told Novara Media, “and the first two months of this year saw one every 30 hours. The situation we’re living is intolerable; we are fed up with occupying the role of the state”. Part of the observatory’s role is to monitor the implementation of law 26,485, which is intended to prevent, penalise, and eradicate violence against women. The law from 2009, Vivanco noted, is comprehensive and includes the creation of a National Women’s Institute. The problem is it lacks funds; currently it is only being allocated 0.007% of the fiscal budget. In UK pounds, that is about 18 pence per woman, Vivanco said. 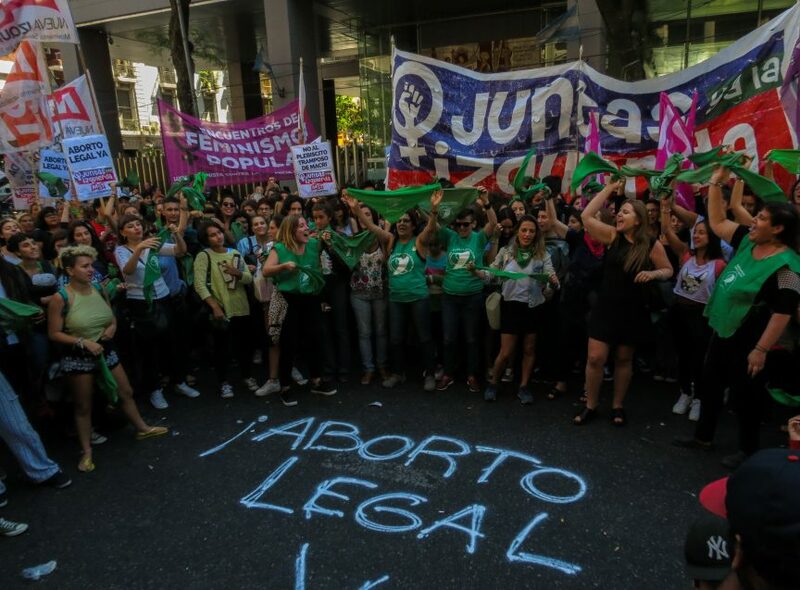 Despite the support for legalising abortion – 55% according to polling by the National University of San Martín – there are still many that oppose it. Abortion cuts across the political spectrum, dividing the centre-left and right. Stella Maris Huczak is an MP for the ruling Republican Proposal, and a fervent opponent of abortion. She considers life to start at the point of conception. Together with 17 other MPs, Huczak signed a counter-proposal to the abortion law, prohibiting terminations except in cases of sexual assault or serious risk to the mother’s health. Even in these cases she hopes to dissuade woman from having abortions: Her legislative project suggests, among other things, giving financial and psycho-social assistance to women who choose to keep their babies after being raped. She thinks this might encourage them not to terminate. Huczak would also like to see proactive social policies to stop unwanted pregnancies. “I think legalising abortion is a thoughtless proposal”, Huczak told Novara Media. “It’s as if we go out one night and have relations with someone, and the next day we go to the hospital to have an abortion. It can’t be like that… while we have the right over our own bodies, that right ends when we infringe upon the rights of others, we can’t decide over the person we have inside us”. For De Ponti, Huczak’s proposal is deeply prejudiced. “It’s absurd to suggest abortion is something women do lightly, plus for examples like hers there’s the morning after pill” she said. The current proposal to legalise abortion is likely to pass through Argentina’s congress this spring or summer. Several demonstrations are planned, to help push the project through both houses of parliament. Vivanco places her optimism in the international feminist movement: “we don’t do what we do because we believe it will succeed, but because we have to” she said. She added: “Us women are the protagonists of the current historical moment, shouldering the resistance against neoliberalism as some of the most dynamic socio-political actors in the world. We haven’t quite begun to fathom the dimensions of what we’re living; we might not see change in our lifetime, but I know our daughters will be freer than we are”.